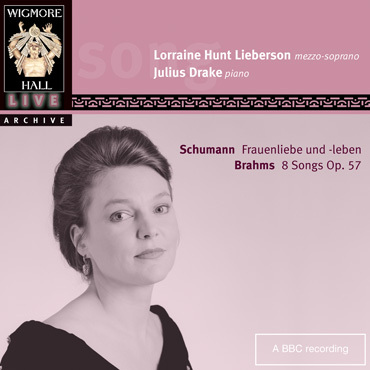 Wigmore Hall Live are proud to release on their Archive series this very special 1999 live recital by the great, beloved American born mezzo-soprano Lorraine Hunt Lieberson who tragically died in 2006. The dramatic intensity and passionate commitment to her material earned her countless comparisons to Maria Callas. Noted for her interpretation of Handel and Bach, this recital of lieder by Schumann and Brahms demonstrates the breadth of her repertoire and her meticulous artistry. After her death, she won the 2007 Grammy Award for Best Classical Vocal Performance for her Rilke Songs and again in 2008 for her performance of her husband’s Neruda Songs. The luminous mezzo voice of Hunt Lieberson is beautifully captured here at a Wigmore Hall solo recital in 1999, six years before her death from cancer at the age of 52. Her singing of Schumann’s Frauenliebe und -leben is almost unbearably poignant, while the sense of nervous gaiety as a bride prepares for her wedding in Helft mir is tangible. The shimmer on the hanging high notes in Süsser Freund glistens like autumn leaves before they fall. The devastating bleakness in the final song, Nun hast du mir den ersten Schmerz getan, stuns the audience. Julius Drake’s piano treads out the death march with ominous restraint.